Eleven of the nation’s top public research universities, including the University of Central Florida, have formed a new alliance focused on helping more low-income and first-generation students earn college degrees. The Bill and Melinda Gates Foundation, the Ford Foundation and four other organizations have contributed $5.7 million to support the University Innovation Alliance’s efforts to expand proven programs to other alliance members’ campuses. The goal is to share and adapt ideas and develop a “national playbook” of programs that will benefit low-income and first-generation students. Today, high-income students are seven times more likely to attain a college degree than are low-income students. The American economy will face a shortage of at least 16 million college graduates by 2025. The founding members of the alliance are focused on addressing the achievement gap and pending shortage at a time when public funding for higher education has been decreasing. The foundations’ pledges were announced Tuesday during a kickoff event in Washington, D.C. UCF President John C. Hitt spoke during a panel session about how sharing ideas improves student success. Provost and Vice President of Academic Affairs Dale Whittaker spoke about DirectConnect to UCF, one of the university’s successful initiatives that may be replicated on other alliance campuses. Joining UCF as alliance members are: Arizona State University, Georgia State University, Iowa State University, Michigan State University, Oregon State University, Purdue University, The Ohio State University, University of California at Riverside, University of Kansas and The University of Texas at Austin. The 11 universities serve a combined 378,000 undergraduates. The schools serve large numbers of low-income and first-generation college goers, and each institution has pioneered programs to help students succeed. The Ford Foundation, The Bill and Melinda Gates Foundation, the Lumina Foundation, the Kresge Foundation, USA Funds and the Markle Foundation are pledging a combined $5.7 million, and that amount will be matched by the participating universities. What UCF Success Stories Can Help Our Partners? 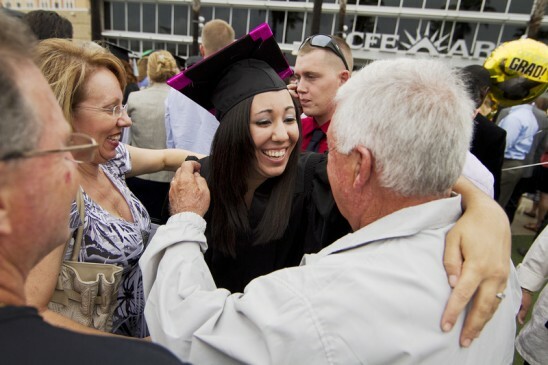 Through DirectConnect to UCF, more than 24,000 students have earned UCF bachelor’s degrees after they first enrolled at one of four partner state colleges – Valencia College, Seminole State College, Lake-Sumter State College and Eastern Florida State College. Many of those students would not have attended UCF if it weren’t for this innovative program. UCF guarantees admission to students who graduate from those four schools, and the university places advisers, financial aid counselors and other staff members at the partner campuses to help students before they enroll at UCF. Arizona State University has already created a pathways program for community college students modeled after UCF’s. The alliance could lead to other institutions adopting similar programs. Alliance partners also may adapt two UCF summer programs that help first-generation, low-income and minority students adjust to college life before they start their fall classes. Students live on campus for six weeks and build their writing, oral and study skills through an intensive instructional program, tutoring, advising and more. What Can UCF Learn From Our Partners? UCF plans to learn initially from the successes of The University of Texas at Austin, Arizona State University and Georgia State University in using “big data” to identify indicators of student success or barriers, and then taking actions to help students overcome those barriers. Georgia State, for example, has increased its semester-to-semester retention rates by 5 percent and reduced the average length of time students need to complete their degree by about half a semester. Graduating earlier has helped Georgia State’s class of 2014 save millions of dollars in tuition and fees.